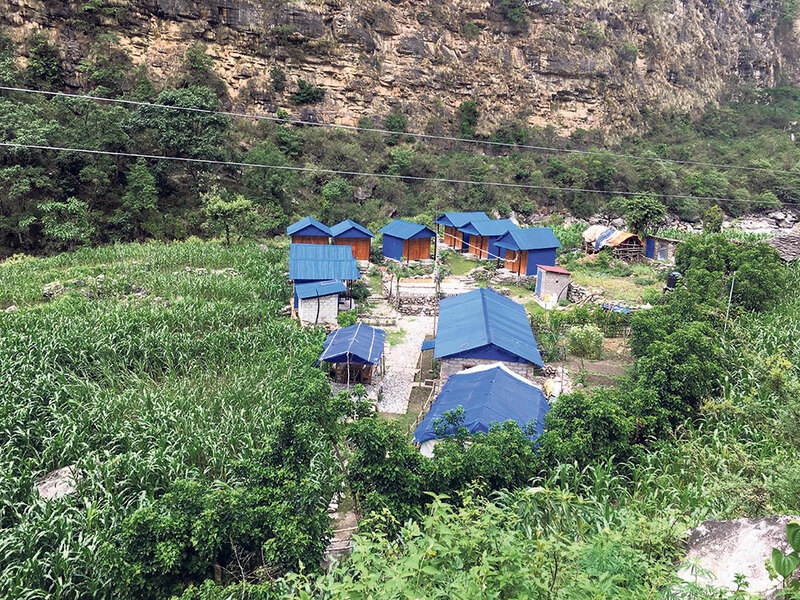 GORKHA, June 24: With the onset of monsoon and the subsequent fall in the numbers of trekkers, owners of hotels and lodges along the Manasalu trekking route are closing their facilities and returning home. "It is off season for trekkers up here and because of that tourists hardly visit here in this season," said Nanumaya Gurung, who owns a hotel in Samagaun, adding, "We will be returning there only after the monsoon is over." Nanumaya who is also a tourist guide and has successfully scaled Manasalu and the highest peak of the world, Mt. Everest is currently in Kathmandu. "Presently I am busy meeting relatives, meeting trekking agencies and buying materials for home and my hotel," she said. Presently almost all the hotels and lodges in Manasalu area are closed or closing. During the peak season, it's hard for the tourists to find accommodation. "It's been a month since any tourists have visited us," said Sabita Gurung, owner of the Family Guest House. During the season, guides and locals have to shelter in tents due to unavailability of rooms in hotels. The road section constructed by Nepal Army, which connects Manasalu Trekking circuit with Larke, is risky at certain points. Though the road is smooth from Soti to Naulikhola, it gets difficult from Machakhola to Khorlabesi. "There is debris of landslides in various parts of the narrow road, which makes it very risky to ride," said Suman Gurung, a local of Sirdibas. While walking through the routes, locals as well as tourists have to fear about stones and rocks that might fall from the cliff above. Earthquake in 2015 has massively affected arrival of tourists in the area. According to Manasalu Conservation Area Project (MCAP), in the year 2016, as many as 1,354 tourists walked in Manasalu Trekking route. Last year, the number of tourists jumped to 7,928, which is the highest till now. In the current fiscal year, a total of 2,366 tourists have visited so far which according to the officials of MCAP is a good number considering the main season is yet come. Nubri valley, Chum area, Manasalu Mountain and Larke Pass are popular destination among local and international tourists.